G's Burgers officially opened June 3rd, 2008. We are a very new building, with many years of extensive planning. The idea of G's Burgers came from the owner George Tsioflikis in 2006. George had always wanted to redo his 50-year-old Carvel building. Instead of just a makeover, he wanted to add a little something to it. By remodeling the building into the home of G's Burgers, Watertown gained a beautiful and elegant white colonial in the center of Main Street and Straits Turnpike. Now this wasn't just a snap-of-the-fingers kind of plan. First, George wanted a unique restaurant that was different from your usual Frankies or McDonalds. He traveled the country visiting established restaurants, taking the best of what they each offered and putting it all under one roof. He wanted a restaurant that could make a burger and fries fresh, right in front your eyes, without using anything frozen. After that was decided, he wanted to think of a style of building as well as parking. After this was finished, his designs had to be approved by the town. It took many hours of deliberation from board members to decide just how this building could fit in with the rest of the town. After many months, a plan was settled on. In the process of finalizing everything, George had another bright idea. The new restaurant would need a name, of course. But what? He decided to involve the loyal patrons of Carvel in the decision of the name. George held a contest where whoever could create a name for the restaurant would receive a 200-dollar gift certificate redeemable at Carvel and the new restaurant. Carvel was flooded with entries, and everyone was hoping to create the one name that stuck out from the rest. Finally a decision was made on the name G's Burgers. Today, G's Burgers stands with its partner Carvel in both Watertown and Naugatuck. The Watertown building has been considered the gateway in and out of Watertown. It is a family-oriented burger restaurant with indoor as well as outdoor seating. If you ever have the pleasure to visit G's Burgers, bring an empty tummy, and if you have a little room, walk just 5 feet over to grab a delicious ice cream cone or choose from our selection of ice cream shakes from Carvel! Since opening in May of 2008, we’ve always ground USDA Select beef and hand-cut our potatoes to make for the best fresh French fries in town. G's Burgers is known for cooking up the best-tasting burgers and fries in all of Connecticut. 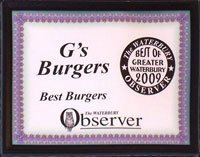 G's Burgers has been voted the BEST BURGERS in the Greater Waterbury Area since we opened our doors by the Waterbury Observer!